Spider-Man and the Punisher share a long, rich history that dates all the way back to ol' skull torso's very first appearance in Amazing Spider-Man #129, during the early part of 1974. While the heroes' personalities couldn't be much more different, they've managed a tenuous coexistence ever since, although their paths have crisscrossed with such regularity that it's grown a bit beyond mere coincidence. And, since Frank's back in the Big Apple again this month, it should come as no surprise to hear his adventures have once again led him into Spidey's territory. This issue struggles to determine what kind of story it would like to tell. 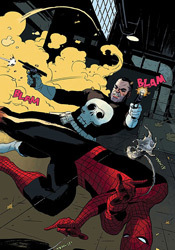 While the tone of Peter Parker's internal monologue at the issue's outset is more in-line with an indie book, self-deprecating and oblivious, it's counterbalanced by an almost Saturday Morning Cartoon-style take on the Punisher and his activities. Writer Zeb Wells drops his readers into a realistic New York City, sharing Parker's insecurities as he tries his luck as a cabbie, and it works. In fact maybe too well, as the sudden leap he then takes into costumed brawling, dead criminals and loud explosions feels completely out of place and unwelcome. One minute we're grimacing and identifying with a down-on-his-luck loser, a'la Optic Nerve, and the next we're watching a skull-faced robot shoot up a roomful of mobsters like freaking Robocop. Couldn't we just stick with one or the other for a little while? The issue's identity crisis is continued, even embraced, by Paolo Rivera's contributions as artist. On some pages he shows the influence of Alex Maleev, Sean Phillips and the gritty current generation of Marvel artists, while on others he channels Ditko, Buscema and the more gestured style of the publisher's old guard. Oddly, his take on Spider-Man himself doesn't look right in either instance. He takes a more disciplined approach to the title character than I'm used to seeing, and while that gives his readers a more realistic visual at times, it robs the character of his personality. While hundreds, maybe thousands, of artists have tried their hand with Spidey over the years, one constant has been his grace and rather unique posturing while in costume. Rivera's rendition is lanky, stiff and awkward. It's like watching the old Spider-Man TV series from the '70s – the costume is right, but the guy wearing it has no idea how he's supposed to be moving, so it never feels like the genuine article. I really can't recommend this one. It doesn't know what it wants to be, nor the story it wants to tell, and even if it did I can't imagine it would be very well executed. On the few instances where it settles down on a specific direction, the issue delivers a plot that's paper thin, renders two A-class characters unrecognizable and craps out dialog that's unfit for any reader. It's frequently ugly, consistently tough to follow and ultimately inconsequential. It's a double-sized issue, too, so skip it twice.